surfs the Web: seems they read AppleMatters and Chris Holland. But if all this is breaking your heart and running Logic on a new 17"
instruments, exclusive software, better Ableton Live performance . . .
power of the Dark Side . . . Okay, okay. Stop the flames. I don't mean it. I love both my Mac and my PC. 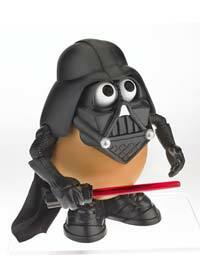 I just wanted an excuse to run a Darth Tater photo.